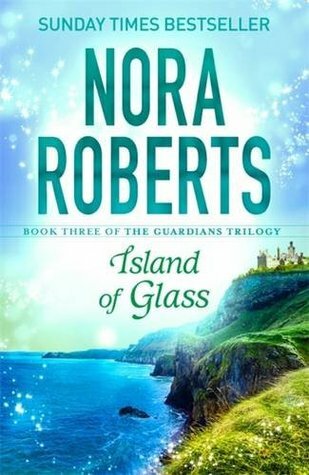 Island of Glass completes the Guardian trilogy in fine fashion. In it we find the six in Ireland, at Bran's place recovering from wounds left by last tussle with Nerezza a goddess of darkness. As it happens this is also the place where Doyle grew up hundreds of years before. This section of the challenge is Doyle's and Riley's, although of course all six work together. There are sparks between the two and a dawning acknowledgement of what they might mean to each other. As well, we still enjoy the play between all six, the fun and joy that Annika brings to the world, the mistakes some make that angers the others, and more training in readiness for the final fight that must inevitably arrive. I thoroughly enjoyed the book, I think this trilogy may become my favourite of Nora Roberts. It has everything, mystery, romance, action, and a dash of all kinds of characters as you can see above. It is witty, has delightful characters, and some ugly ones, a fast moving plot set in a beautiful part of the world. It is with regret that I know we say good-bye to these characters, a mark of a good book for me is when I want more. But some wishes can't be granted! I kept seeing book two of this series in the New Fiction section. I had told myself in the past I would stop reading her trilogies b/c sometimes the steam runs out early. I love the start of the Witch one but the third book was redundant in its content about the supposedly star-crossed couple. I may give this one a go. The covers are eyecatchy. That's high praise, Kathryn! I haven't read any of her fantasy/paranormal books but you've put this series on my radar. Great review! I absolutely loved the first book in the series and just finally got my hands on the 2nd book which I can't wait to read. I loved the personalities of the 6 in the first book and am really excited to start reading Bay of Sighs and am thrilled to hear this one held up as well. Riley was my favorite character and it would have been so disappointing if she had gotten a flat book. I cannot wait to read this. I placed it on my Secret Santa list and need to wait before buying/reading it.